I often write about the importance of managing your domain names and caution people about what could happen should they fail to do so. I recently witnessed a chilling example of this. Thankfully, this story has a happy ending. Erella Ganon is a Toronto-based artist whom I have known for over a decade. She also happens to be a friend of my wife. On Friday night, my wife asked me to look into something on behalf of Erella. A few days prior, Erella had lost ownership of her domain name, erella.com, and she was very upset. Erella had first registered erella.com in October, 2000 with domain registrar GoDaddy, and had been using it since then for her Website and email address. Her Website, located at www.erella.com, is where Erella showcases her work and promotes her services. It is her primary means of generating employment. 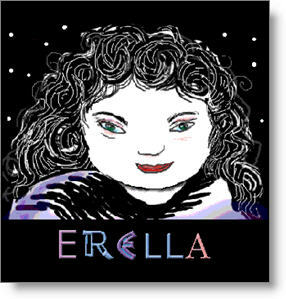 An artist and single mother, Erella supports her teenage daughter by doing a number of freelance creative assignments. Sadly, for many years, Erella has also been battling brain tumours. 2008 has been especially difficult for her as she's been in and out of the hospital for seven different surgeries. The good news is that she's on the mend. During the last few months, in between surgeries and post-operative recovery, Erella was unable to do a lot of her normal day-to-day activities, and due to a misunderstanding, didn't renew her domain name like she normally did. The domain expired, and 26 days later it flowed into GoDaddy's expired domain auction, where it was bid upon and eventually acquired by a domain name speculator based in Hawaii. Since I work at Tucows, one of the largest domain registrars in the world (and, full disclosure, a competitor of GoDaddy), I am very familiar with the domain name lifecycle and expired domain auctions. I knew that the domain speculator had broken no laws when he acquired the erella.com domain name. It expired. He bid on it. He paid for it. He now owned it. To him, erella.com was just another domain name he won at auction. He didn't know the story behind how and why the domain expired, nor would anyone expect him to have known that. At the time I first heard about this, Erella was convinced she'd lost her domain name forever, and was understandably very upset. Email messages to her were bouncing, and adding insult to injury, the domain speculator had added a banner ad for his Hawaiian real estate business to Erella's homepage. I promised Erella that I would investigate what had happened and see what I could do to help. After researching and identifying the domain speculator, I contacted him via email on Saturday in Honolulu and convinced him to transfer the domain name to Erella. By Sunday morning, erella.com was back in Erella's hands, and by mid afternoon her email and Website were up and running again. Needless to say, Erella was ecstatic. I, on the other hand, was pleasantly surprised. This domain speculator responded to my inquiries and could be reasoned with; that is not always the case, and I have the scars to prove it. The truly frightening thing is that this can happen to anyone who owns a domain name, and most people who find themselves in this difficult position don't know a domain name specialist like me that they can turn to for help. With that in mind, I'd like to offer five very specific pieces of advice to you on how to avoid ever ending up in a situation like this. Ensure that your domain registrar has your most current and working email address on file. 99% of registrars inform their customers about upcoming domain expiries via email. If the email address they have for you doesn't work any more, you will miss the reminder messages and are at risk of forgetting to renew the domain name. In my professional experience, not having the right email address associated with your domain name is the number one reason people lose their domain names. This is your responsibility, not the registrar. Verify that your domain registrar has up-to-date payment information on file for you. Even if you have set your domain name to auto-renew, that won't do you any good if the credit card the registrar has on file is no longer valid. Make sure your registrar has the correct credit card number and expiry date. Domain name registration is not the same thing as Website hosting or email hosting. Even if you are getting these services from the same company, they are three different services and will all need to be renewed at some point in time. People often confuse Website hosting renewals with domain renewals and mistakenly think they've renewed both when they've actually only renewed one. Finally, if your domain name does expire, act quickly. Contact your domain registrar as soon as possible and ask them what your renewal options are. In most cases, you only have 25-39 days to renew a domain that has expired. After that, it could be gone forever.